This is a beautifully bound and printed publication by Orthodox Witness, and includes detailed Topic, Author, and Scriptural Indexes, as well as 8 pages of full-color illustrations. It is a detailed critique of post-lapsarian Christology in 684 pages, but it is not presented as dry theology; rather it is enriched with deep and authentic patristic truth with an abundance of sources that clearly show Christ was not born with a fallen human nature, but a pre-lapsarian (pre-fallen) human nature just as Adam had in Paradise. 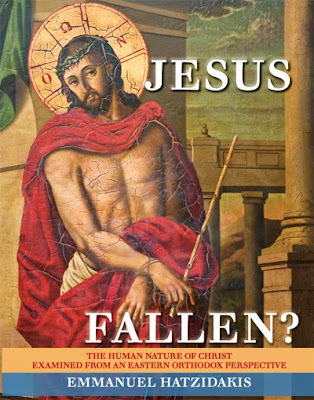 It begins by offering an overview of the issue among both Orthodox and non-Orthodox, then it continues by analyzing the nature of man before and after the fall, and after a thorough examination of the details of Orthodox Christology, the author begins to address the issue. Key questions are asked, such as: Are the blameless passions of Christ inherited or voluntarily assumed? Was Christ's humanity necessarily corruptible and mortal? Would Christ have died of "natural" causes? How do the two natures exist in Christ? What is the impact of Perichoresis and Antidosis? And after an entire chapter is dedicated to the sinlessness of Christ, he addresses the objections of those who submit to the post-lapsarian thesis, which I thought was most valuable. This is followed by a chapter in which the author ties everything together with the Orthodox patristic theology of Soteriology and Christology.